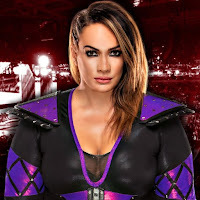 - Here is backstage video of new RAW Women's Champion Nia Jax talking to the cameras after her big win over Alexa Bliss at WrestleMania 34. Jax says she's glad for the message that she wants to send boys & girls around the world - to stand up for themselves, never take crap from people and let them make you feel less than or insecure. - Below is backstage video of WWE NXT Superstars Kairi Sane, Dakota Kai, Peyton Royce, Bianca Belair, Taynara Conti and Kavita Devi backstage reacting to their appearances in the WrestleMania Women's Battle Royal last night, which was won by Naomi.